Planning has begun for the 11th Annual Turkey Trot 5k! Are you ready to Trot? We are excited to return to Lykins Park, located at 1601 Mt Sterling Rd, Winchester, KY 40391. Can we count on your support as a participant for our 5k which will take place on Saturday, November 10th at 9:30? This event will raise money to help assist 1,300 families that seek assistance from us each month, within those families there are approximately 600 children. Clark County Community Services (CCCS) has served families in need since 1975, by providing food, shelter and utility assistance. CCCS encourages self-sufficiency with case management and educational classes. 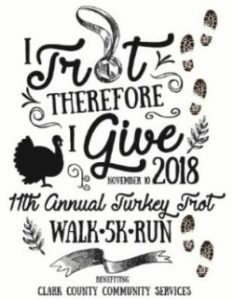 Please go to https://racesonline.com/events/turkey-[clarkcountycommunityservices.us11.list-manage.com]trot-5k[clarkcountycommunityservices.us11.list-manage.com] to sign up! You can sign up as an individual or a team. If you would like to sign up as a team and have not done so before, please contact Kristy Weckwert at kristyweckwert@clarkcountycommunityservices.com with your team name and she will create a drop down for your team. If you have ever registered as a team, your team name will already be in the drop down. Registration during September only costs $20, October 1st– November 7th will be $25 and, the day of race will be $30. To be guaranteed a shirt you should register by Tuesday, November 6th.